I got the chance to go with Grace to one of her last days of first grade this week. The nurse was sick and no one could cover- but after a quick scramble Kevin and I had Grace on the bus and off to school. She had a seizure on the bus. She kept going as I tried to wheel her into the school- trying to keep her arm from being caught in a door as it continued to jerk away from her body – a line of school professionals just watching me try to navigate the situation. One of them joked about her not cooperating. She just didn’t know she was seizing and I let that go. That seizure ended. A few minutes later another one started. It ended. And we were off for our day. 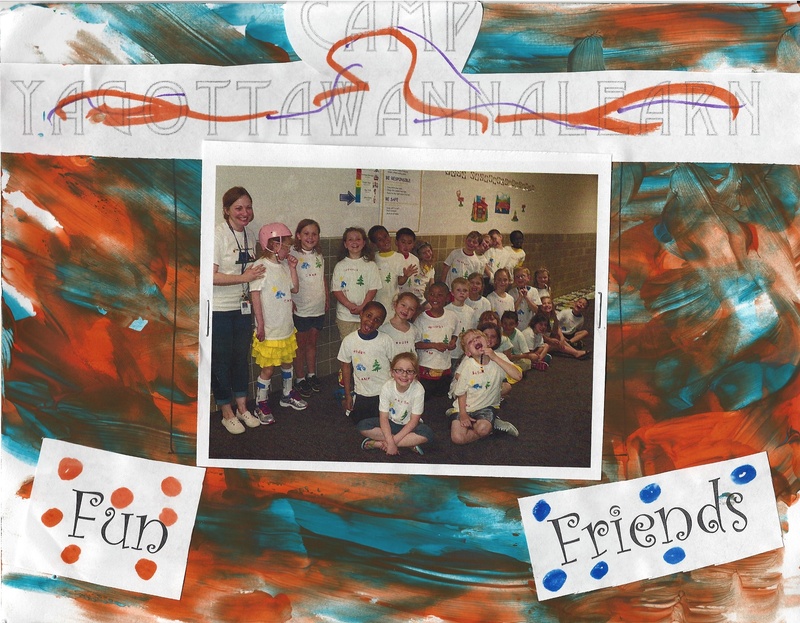 It was a special day – Day 2 of Camp GottaWannaLearn. We were to spend the morning in the general ed setting rotating between the different activities. “Have fun!” they told us as we left the special ed room. I hoped we would – two clusters of seizures back to back left me a little anxious about how the day would go. I wanted so badly for Grace to have fun at camp. It was fun. Different fun than for others I imagine. For me it was awkward/fun. First the awkward: Where to put the wheelchair so it’d be out of the way? Having stilted conversation with the other mother in our group. Trying to figure out when I could sneak away to change Grace’s diaper and get her a bolus of water. Trying to fit her in a spot on the floor not meant for a 1st grader with leg braces (that make it hard to bend up small in criss-cross applesauce style) accompanied by her mom. Leaving a few minutes earlier than everyone else so we’d be to the next thing on time. Playing games that were not adapted to Grace. Having a hard time keeping Grace’s place in line because Grace did not want to stay in line. Holding her back because it felt like we’d be run over when switching activities. Doing the craft project for her, helping the boy next to her, and trying to keep her from spilling beads everywhere all at the same time. The fun: One teacher immediately had an alternative for us. Finger painting rather than painting with magnets above our heads. Brilliant! Grace loved that! Kids complimented her on her painting. Others wanted to work with her in small groups in another activity. She enjoyed being around everyone and part of everything. She paid attention to the ghost story. I marveled at their abilities. The abilities of “normal” first graders. Math. Humor. Spontaneity. Problem-solving. Concentration. Reading. There was one point when we were lined up to play a game and Grace was paired with another girl. She’d been in Grace’s kindergarten class. The girls were supposed toshake hands and say “good luck” to each other before the game began. I put out Grace’s hand – it was clean and dry- completely shakeable. The little girl refused. High-five? I asked her. She nodded. I put up Grace’s hand. She put her hand up – but did not touch Grace. My heart hurt but I just kept going. “you have to touch it” I teased gently and held Grace’s hand up again. She did – with just a finger. There was no “good job” shake at the end of the game. We came back to the special ed room for lunch and meds – both a little exhausted. We weren’t all back together yet and the 1st grade teacher wanted Grace for a class picture. We got her put back together, and I got her down the hall where my heart again fell as I realized everyone else was wearing a camp shirt. Grace had brought hers home the day earlier and no one had told me to send it back. She was going to stick out- damn. But the teacher had an extra shirt. We put it on. The teacher volunteered to stand by Grace and I took the picture. Grace would not look anywhere near the camera- but she was in the picture, standing up, looking at the kids in her class! Back in the special ed room I watched her answer questions about a book. Work on big vs. little. I held my breath as she walked all by herself – no one holding on from the special ed room to her 1st grade room. It’s a long walk! I was so proud I could have cried – but there was no break in the action for that. Back in first grade we made a tent out of an easel and a sheet. We read a book with a flashlight and a friend – wonderful! And then we had guidance where we talked about careers. The guidance counselor was telling the kids there will be more emphasis on careers each year as they grow older. So I was forced to wonder – what career will Grace use as they progress? What will they be told if they ask about Grace? Will anyone ask us what career we want them to talk about for Grace? Ugh. Then there was music. Grace was tired – she started to cry. I got her out of her chair and sat on the floor – probably not on her assigned square – but I didn’t know what that was. As we sang she calmed down. She leaned in. I was happy to be there to give her that rest and comfort. It’s a lot that she does every day. We were both pretty tired when we got home. In fact in a lot of ways I’m still tired today. It’s so emotional to be so surrounded with what could have been-and then to have to fight just to keep a place in line. To recognize that it’s only going to get more complicated, and the divide wider and wider. I tell myself I’m not going to worry about the girl who wouldn’t touch her. Grace won’t win over everyone – no one does. I’m going to be grateful for our princess friend and others who have found their way to seeing Grace and are happy to give her a high-five. I’m going to be grateful for the chance to finger paint. I’m going to be grateful that she is walking down a hall all by herself – and that she’s curious enough she’ll veer towards the bathroom just to check it out on the way. I’m grateful that somehow there is an extra shirt and that the teacher thought of it without me having to say a word. One day of first grade left.